We are offering our new product magic heart shaped heat pad. Magic Warm pad(Magic hand warmer) heart shape for warming and muscle relax. It is convenient or travel, camping, sail, outdoor game and work. It is good warming product in winter. It is also a lovely and warm gift. What is happening here is strange but can be understood if you think about water freezing. Water freezes at 32 degrees F or 0 degrees C. If you were to stick a thermometer in a cup of water and put the cup in the freezer, you would find that the temperature of the water falls to 32 degrees F and then hangs there until all of the water is completely frozen. Then the temperature of the solid water falls to the temperature of the freezer. What if you could somehow super cool the water? That is, say that you could get the water's temperature to 10 degrees below freezing without it crystallizing into a solid (you can sometimes do this using a very clean glass and distilled water so there are no points for the water to begin crystallizing). In this condition you can tap the glass and the temperature of the water will jump up to 32 degrees F/0 degrees C and the water will solidify quickly. Our magic heating pads contain sodium acetate and water. It turns out that sodium acetate is very good at super cooling. It "freezes" at 130 degrees F or 54 degrees C, but it is happy to exist as a liquid at a much lower temperature and is extremely stable. Clicking the disk, however, has the ability to force a few molecules to flip to the solid state, and the rest of the liquid then rushes to solidify as well. The temperature of the solidifying liquid jumps up to 130 degrees F or 54 degrees C in the process. When you boil the solid you melt it back to the liquid state. You have to completely melt every crystal or the liquid will quickly re-solidify. You can repeat this cycle thousands of times, just as you can freeze and melt water as many times as you like. 1. Flex metal disc back and forth until crystals form. 2. Knead pad to soften. 2. Place a cloth on bottom of pot. 3. Place the pad on cloth inside the pot, and continue to boil water until all crystals are dissolved, and the pad is completely clear. 4. When the pad is completely clear take it out of the water and place it on a cloth to cool down. Completely clear means completely clear. If even one tiny little crystal is left the liquid will quickly re-solidify. Hold the pad up against a light and make sure there are no crystals left. If there is even one tiny little crystal, continue to boil until it melts. 5. When the pad cools down, it is ready to be used again. 6. If crystals start forming while the pad is cooling, repeat steps 1,2 and 3. If you want to make custom Health Care Gift-Heart Shaped Heat Pad with your logo,slogan,telephone,website,email , please send us your design or give us instructions about your imprint.We'll send a free virtual art proof for your approval,you can ask a real sample with logo before production too. 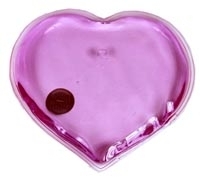 Our Health Care Gift-Heart Shaped Heat Pad is popular as promotional,advertising, business,corporate gifts.